With rapidly growing volumes of fuel cell vehicles in use around the world — from passenger cars to buses to fork-lift trucks — there is a rapidly growing need for hydrogen generation systems to make the hydrogen fuel for these vehicles. One of the best ways to do this is with a Giner on–demand, on-site system making hydrogen from electricity — especially when the electricity is sourced from solar, wind or another source of renewable power. Thousands of Giner on-site hydrogen generators are in use around the world. They are extensively used by leading system manufacturers to provide high purity hydrogen at high efficiency and low cost for renewable energy storage, CO2 methanization and for on-demand generation of high purity laboratory hydrogen for applications such as gas chromatography and flame ionization detectors. Giner leads in California On-site Refueling! 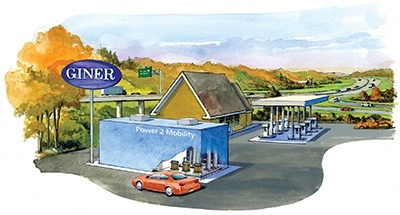 Giner is supplying 3 high efficiency hydrogen generation systems for fuel cell vehicle refueling stations being constructed by our partner Hygen in California, with funding support from the California Energy Commission. This will make Giner the leader in CA for on-site hydrogen generation systems for fuel cell vehicle refueling. Motorists who fill up their fuel cell car with hydrogen at a Hygen station in California will know that their car is being powered by renewable energy! Our Merrimack stack is one of the largest commercially available PEM electrolyzer stacks, capable of producing 30Nm3/hr or ~35kg in a 12-hour period. In testing at the US Department of Energy’s National Renewable Energy Laboratory, the efficiency of the stack ranged from 95% to 75% at current densities exceeding 30 kA/m2 . These exceptional efficiencies correspond to an energy consumption of less than 50 kWh per kilogram of hydrogen produced and are essential in building a compelling economic business case for the technology. Giner hydrogen generators can produce hydrogen and oxygen at differential pressures from ambient to 40 bar (580 psi) and beyond, without external gas compression. For applications requiring pressurized hydrogen this feature can reduce the need for external mechanical compression, resulting in a major capital cost and maintenance cost saving. Giner is also at an advanced stage of development of a larger stack platform, the Allagash stack, which will be a single “Megawatt” stack capable of producing at a rate of over 200 Nm3/hr.